A van containing more than 200,000 ballot papers destined for polls in East Sussex has been stolen. The papers had been printed in London and were being taken to two constituencies - Hastings and Rye and Eastbourne - ahead of voting in the general election on 7 May. Metropolitan Police officers alerted both Hastings and Eastbourne councils about the theft in London overnight. Officers found nothing to suggest the van was targeted for its contents. Police told the local authorities they believed it was a coincidence the stolen van contained ballot papers. The theft is still being investigated. Local authorities in Sussex said the vehicle contained 72,300 voting slips for Hastings and Rye, and 130,000 for Eastbourne. Both Hastings and Eastbourne councils said arrangements had been made to reprint and deliver further papers. A Hastings council spokesman said: "We have been in touch with the Electoral Commission and following their guidance we have put a process in place which will ensure that these ballot papers are not used for fraudulent purposes and cannot be included in the count." At Eastbourne council, a spokeswoman said replacement ballot papers were being printed on different coloured paper to the original batch. She said this meant any stolen papers placed in ballot boxes could be easily detected and removed. She added an "unavoidable anomaly" was that previously issued postal vote papers were on original colours and could be posted or handed in at a polling station until polls closed on 7 May. But she said those ballots had to be returned with associated paperwork and were subject to a rigorous scanning process. Police said it was believed the van was parked in Longbridge Road, Dagenham, at about 19:30 BST on Tuesday. The theft was discovered at about 06:25. The vehicle was described as a white Mercedes Benz Sprinter, registration KN64 UPD. 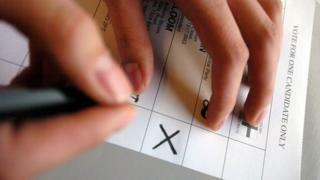 Election 2015: How feasible would it be to introduce online voting? Are British general elections stuck in the 1950s?